Riesling is one of the most food-friendly wines available, but the problem is that it really comes in two styles in new world varieties. If made in the traditional European style, Riesling pairs with seafood, chicken, vegetables. However pairing food with Riesling made in the more common, sweeter, new world style compliments some seafood as well as many eastern Asian and Indian cuisines. If only most Americans actually knew what this grape could be under the right conditions. Our version is often grown in regions that are too warm, which renders a grape with too much sugar and not enough acid. Even new world wine competitions acknowledge this by having different categories for different residual sugar levels. Because of Riesling’s split personality, we’ve broken this post up into two sections. 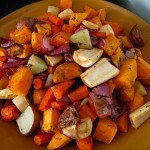 The first is for Riesling food pairings for wines made in a drier European style. The 2nd pairs sweeter Riesling with foods more appropriate for them. Dry Riesling is an ideal wine for vegetarian dishes with light or no sauces, in addition to seafood and chicken. 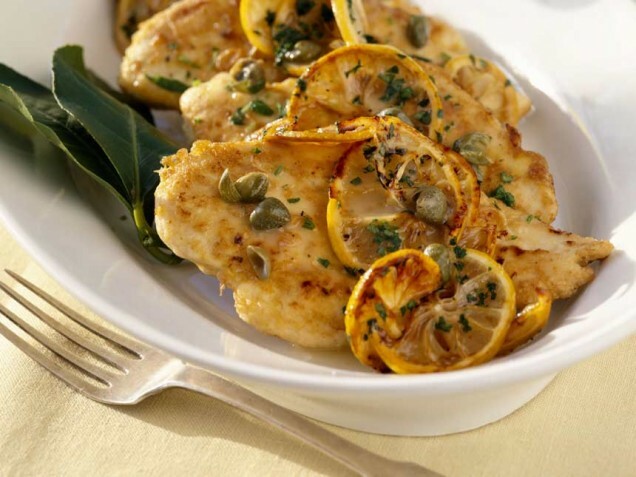 When looking for dry Riesling food pairings, look for simple fish, chicken, or pasta dishes that have some acid to them but avoid stronger sauces like anything tomato based. These simple flavors are a great food for Riesling’s light, crisp taste. 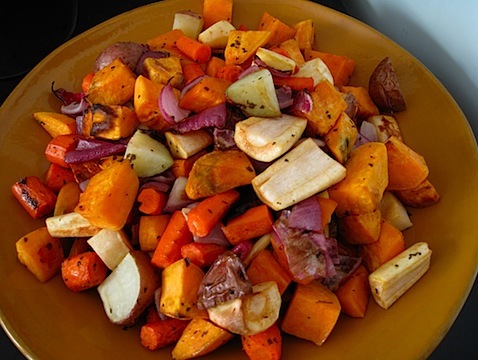 Anything heavier would overwhelm the simple flavors contained in this dish. This simple salad uses mustard and cider vinegar to create flavor rather than the traditional mayonnaise which can clash with Riesling’s bracing acidity. This simple grilled fish with an uncomplicated sauce is a great food compliment to Riesling. This recipe allows the simple flavors of both the wine and the fish to shine. 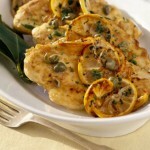 Chicken Piccata derives much of its flavor from the acidic lemon juice and briny capers used in its preparation. Riesling’s clean flavors won’t overwhelm the simple flavors from the chicken and the sauce. If you want a slightly lighter version, omit the flower dredge and use just a little less olive oil. 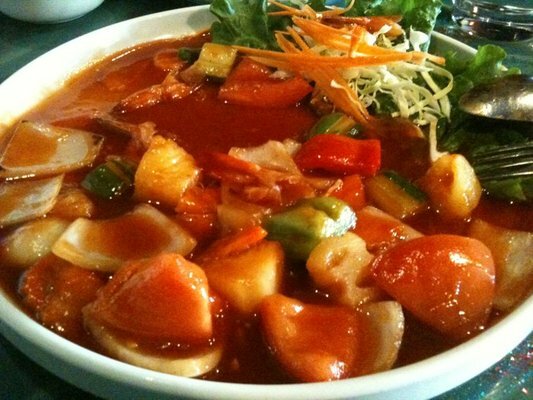 You may need just a touch of flour at the end to give the sauce a little body, however. Sweeter Riesling pairs with food completely differently. Where we looked for simpler flavors and often with a little acid, sweeter Rieslings compliment slightly sweeter foods. 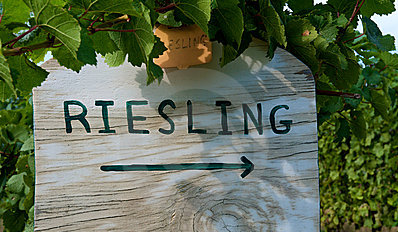 Rieslings are often called “off-dry” if the flavor if not overtly sweet. This slightly sweet, slightly hot pasta dish hits all the notes to compliment an off dry or sweeter Riesling. The sweet meat of the shrimp by itself is a great food complement to Riesling. 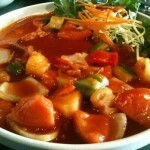 If you want a little more flavor, dress it up a bit with a fruit based salsa or a spicy sweet and sour shrimp. If you go for a fruit salsa, just make sure there is not a strong acidic flavor to it. The molasses in this BBQ Pork recipe imparts a rich sweetness which is a natural food pairing with an off dry Riesling. For dry Rieslings, avoid sweeter foods or your wine will end up tasting like vinegar because your taste buds quickly become used to the sweeter taste of the food. For sweeter Rieslings, avoid pairing them with acidic foods or it will quickly taste like a dessert wine. Dry Riesling is not an ideal wine for cheese. It’s just too acidic. Sweeter Rieslings however can pair with blue or green cheese, although Ports and dessert wines with even higher sugar levels are usually better compliments. Sweet Riesling pairs with almost any cuisine that has a sweet element to it. Mostly those foods come from Asia but as was illustrated above, any honey, molasses or sugar based sauces are likely a good compliment for sweeter Rieslings. Many of these flavors can also be found in Southern BBQ. Learn more about Riesling like serving temperature and the ability to age by clicking here.